There are a number of similarities between the game of squash (softball) and running a startup. Great squash players often make great startup ceo’s because of the kind of issues that face both activities. 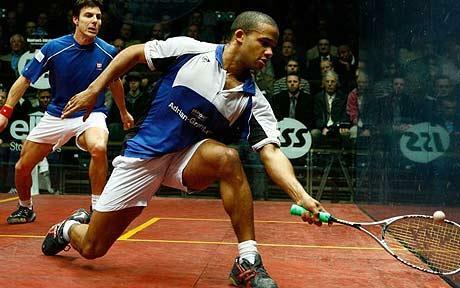 Squash was invented in Harrow School out of the older game racquets around 1830 before the game spread to other schools, eventually becoming an international sport. Squash made its way to North America in 1884. Players serve to the front wall and players take turns hitting the ball against the front wall, above the tin (line running on the bottom of the front wall) and below the out line. The ball may strike the side or back walls at any time, as long as it hits below the out line. The game is very similar to other indoor racquet sports with more defined boundaries, where out of bounds can be below a line as well as above a line. As a game, squash takes more patience than the more popular racquet ball. Squash has fewer kill shot opportunities because it requires more control since there are more out of bounds areas. Squash requires patience. Rallies never seem to end as players hit nicks, retrieve kill shots, lob, and drop, re-drop and re-re-drop most of the action in the front court. Players must maintain patience waiting for the opportunity to strike. Startup CEO’s must be patient, even in the midst of intense activity. Timing is often considered a key component of startup success. Startups often fail because they are too late or too early to a market. There is no down time in Squash. The rallies are not only long, but they are also fast and intense. Players have to move quickly. Squash ball speeds can hit 175 miles per hour. CEO’s have to move fast. The market moves fast. Lots of decisions have to be made. Sometimes it feels like ready fire aim. Squash and Startup CEO’s work in confined spaces. The squash court is relatively small and confined. — 6.4m x 9.75m x 5.64m. If players bump into each other, which can happen often, a “let” is called, which requires a replay of the point. Successful startup CEO’s must work within confines and constraints even with a big vision. The best startups are laser focused while maintaining perspective, but not a lot of energy, on the larger vision. Other sports share some or all of these same characteristics. Next time you are interviewing a candidate, ask them what sports they play. If squash is one of them, pay more attention to the candidate.